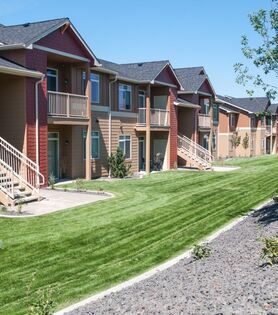 Warm earth tones, natural decorative elements and lush grounds welcome you to The Homestead, an inviting apartment community in the heart of Spokane Valley. Spread out over twelve acres, these residences are a tribute to the rugged beauty of the Inland Northwest – with detailed exteriors featuring intricate stonework and cedar entryways. Live in a one, two or three bedroom home with charming features such as gourmet kitchens, inviting balconies and modern color schemes. Relish a community-centric setting where you can grill steaks with neighbors, unwind in the patio lounge or sunbathe by the tranquil pool. From the rustic façade to the spacious layouts, these homes offer a relaxing and homey lifestyle. With an idyllic location between downtown Spokane, Liberty Lake and Coeur d’Alene, The Homestead is a breath of fresh air in a natural landscape, yet with the convenience of being so close to everything you need. Reach out today to schedule a tour and start envisioning your incredible new life at The Homestead.